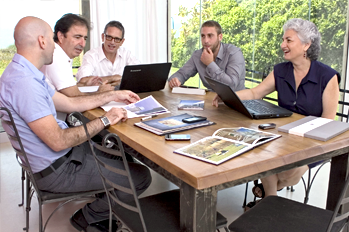 Neot Shiran is Israel's most professional luxury homes marketing agency. Our professional team of expert advisers and realtors bring forth years of accumulated experience as well as honed negotiation skills, which enable them to facilitate the execution of even the most complex transactions. The company provides confidential and effective services pertaining to marketing luxury apartments, villas, mansions, farms, penthouses and luxury homes in the Gush Dan metropolitan area and the Sharon plain, worth over NIS 10M. The company focuses on offering comprehensive services throughout Israel's most desirable and prestigious areas, including Caesarea, Arsuf, Kfar Shmaryahu, Herzliya Pituah, Tel-Aviv's most luxurious neighborhoods (including Tel-Baruch, Tzahala, Afeka, etc.) and high-end moshavim across the Sharon plain and the Gush Dan metropolitan area. The uncompromising discretion, the professional consultation and support and the wide professional network that includes numerous clients both in Israel and abroad, allow us to see through lucrative, worthwhile real estate transactions to the complete satisfaction and benefit of all parties involved. In case you're the owner of a property or in case you're interested in selling property in one of Israel's most prestigious areas, such as Caesarea, Kfar Shmaryahu, Arsuf, Herzliya Pituah, Tel-Aviv and its shoreline, Tel-Baruch, Afeka, Tzahala, Savion, or any one of the Sharon Plain's high end villages or moshavim, our team of experts will gladly offer a non-binding, complimentary introduction and consultation session. The professional services offered by Neot Shiran include comprehensive, personal, and ongoing discrete consultation regarding the transaction's economic feasibility, worthwhileness and timing. Additional services, solutions and information are also offered, covering all relevant aspects: finance, architecture, appraisal, taxes and legal issues. For every property, we specialize in finding the most suitable clients relying on a sophisticated system with an international database and advanced algorithms. Contact us and Neot Shiran's experts will get the job done efficiently and discretely.